We're delighted to announce that Gardant has been invited to provide security services for selected events at The Landmark Theatre in Ilfracombe, North Devon. The Landmark Theatre is part of North Devon Theatres Trust and is one of the leading arts and entertainments venues in the South West. 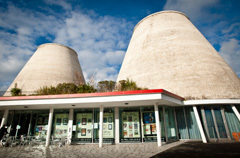 Opened in March 1998, with support from the National Lottery Arts Fund, the Rural Development Commission, the European Regional Development Fund and local authorities, the theatre's radical conical design has won numerous awards, including the prestigious RIBA Regional Award for Architecture. The main theatre space seats 480 people, with beautiful open spaces and a Pavilion that can seat an additional 200 people. The Landmark presents an eclectic programme of performing and visual arts, as well as a diverse range of events for which Gardant is proud to provide front of house security services.